Here’s the 2016 Cactus League schedule for the Brewers! A cool game between the MLB roster and the Biloxi Shuckers roster in Biloxi at MGM Park on April 2. The Milwaukee Brewers today announced the Club’s 2015 Spring Training broadcast schedule that will include 16 radio broadcasts on 620 WTMJ and the Brewers Radio Network, 13 additional audio webcasts, and 12 games televised by FOX Sports Wisconsin. All games played in the Cactus League are scheduled for 1:05 pm Arizona Time (except for March 13, March 23 and March 24, which will start at 7:05 p.m., 1:05 p.m. and 6:40 p.m. Arizona Time, respectively). The only games that will not be broadcast on either radio, TV or webcast are the Wednesday, March 4 exhibition against the University of Wisconsin-Milwaukee and a road split-squad game on Sunday, March 15 at the Rangers (NOTE: The Brewers home game against the A’s that day will be broadcast on radio and TV). Tickets for the Milwaukee Brewers home Spring Training games are on sale now via the internet at Brewers.com and by phone at 1-800-933-7890. Normal business hours are from 9 a.m. – 5 p.m. CST. Sales at the Maryvale Baseball Park Box Office will begin on Monday, February 9, 2015. Tickets are available in four seating areas: Field Box ($23), Infield Reserved ($17), Outfield Reserved ($13) and Lawn Seating ($8) In addition, there will also be a limited number of advanced parking passes available for $5. Information on Spring Training Season Tickets can be obtained by calling the Milwaukee Brewers Ticket Office at 414-902-4000. 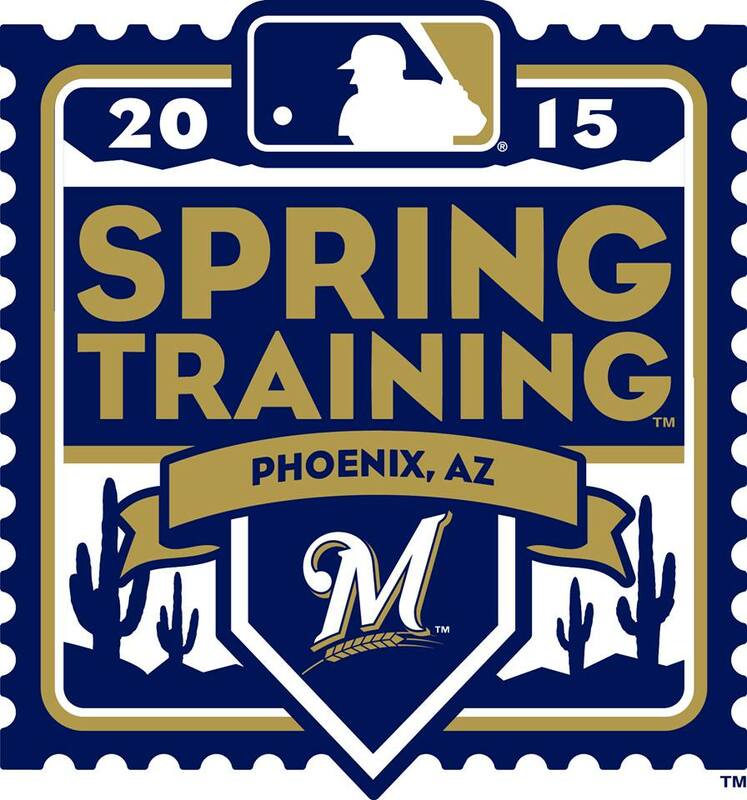 The Milwaukee Brewers today announced the Club’s 2014 Spring Training broadcast schedule that will include broadcasts of all 31 Spring Training games and the televised broadcast of all 14 games at Maryvale Baseball Park by FOX Sports Wisconsin. In addition to the scheduled games on FOX Sports Wisconsin, the flagship radio station for the Milwaukee Brewers, Newsradio 620 WTMJ-AM, will broadcast 16 games on the statewide Brewers Radio Network. Seven select games that are not on television or radio will be broadcast exclusively on Brewers.com. All games played in the Cactus League are scheduled for 1:05 pm Arizona Time (except for March 27, which will have a 12:05 pm Arizona Time start). Hall of Fame announced Bob Uecker and his partner Joe Block will call the games on the Brewers Radio Network. Television announcers Brian Anderson and Bill Schroeder will call the games on FOX Sports Wisconsin. Anderson, Block and Schroeder will team up on the Brewers.com webcasts. 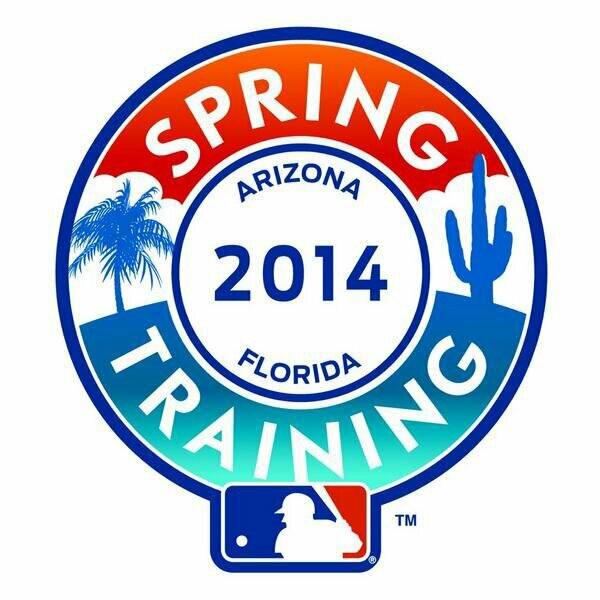 Pitchers and catchers are scheduled to report to Spring Training on Saturday, February 15. All position players have a report date of Friday, February 21. The first full workout is scheduled for Saturday, February 22. Tickets for the Milwaukee Brewers home Spring Training games are on sale now via the internet at Brewers.com and by phone at 1-800-933-7890. Normal business hours are from 9am – 5pm CST. Sales at the Maryvale Baseball Park Box Office will begin on Monday, February 3, 2014. Tickets are available in four seating areas: Field Box ($23), Infield Reserved ($17), Outfield Reserved ($13) and Lawn Seating ($8) In addition, there will also be a limited number of advanced parking passes available for $5.00. Information on Spring Training Season Tickets can be obtained by calling the Milwaukee Brewers Ticket Office at 414-902-4000. Tickets for the two games at Miller Park will go on sale at a later date. 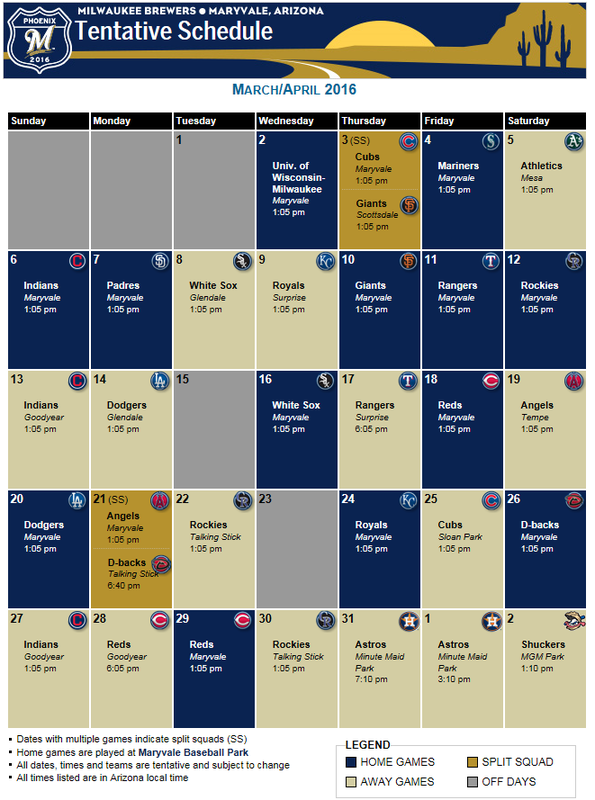 The Milwaukee Brewers today announced the Club’s 2014 Spring Training schedule that will open on Thursday, February 27 at Phoenix Municipal Stadium against Oakland. The Brewers will play a total of 29 Spring Training games in Arizona, including 14 at Maryvale Baseball Park, plus two exhibition games at Miller Park against Kansas City (March 28 and 29). The Brewers will play games at Maryvale against their National League Central Rivals Chicago Cubs on Monday, March 3 and Cincinnati on Saturday, March 15. The Brewers will also celebrate St. Patrick’s Day with a game against the Chicago White Sox at Maryvale. The team has two split squad games scheduled during the spring. The slate includes Saturday, March 1 vs. the Los Angeles Dodgers (the Maryvale opener) and at Arizona; and Sunday, March 9 at the Chicago Cubs and at Cleveland. The final home game at Maryvale Baseball Park for the Brewers is set for Thursday, March 27 against Seattle. The Brewers will return home to Miller Park to play two games against Kansas City on Friday March 28 at 7:10 p.m. and Saturday, March 29 at 1:10 p.m.
All games played in the Cactus League are scheduled for 1:05 pm Arizona Time. Tickets for the Milwaukee Brewers home Spring Training games will go on sale at 9 am CT on Friday, December 6 via the internet at Brewers.com and by phone at 1-800-933-7890. Normal business hours are from 9am – 5pm CST. 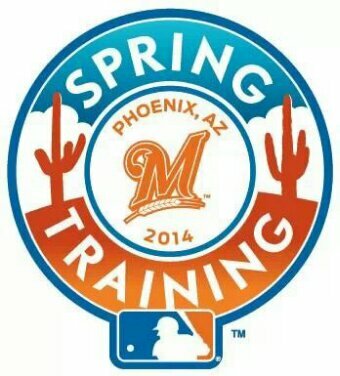 Sales at the Maryvale Baseball Park Box Office will begin on Monday, February 3, 2014. Tickets are available in four seating areas: Field Box ($23), Infield Reserved ($17), Outfield Reserved ($13) and Lawn Seating ($8) In addition, there will also be a limited number of advanced parking passes available for $5.00. Information on Spring Training Season Tickets can be obtained by calling the Milwaukee Brewers Ticket Office at 414-902-4000. Tickets for the two games at Miller Park will go on sale at a later date.